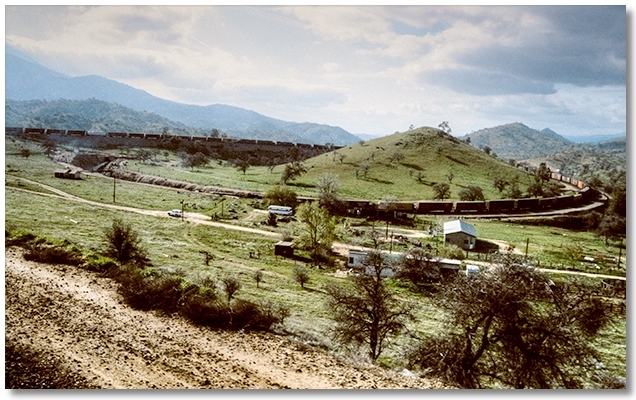 In the Spring of 1982 I took a train trip to Southern California to visit my family. I had ridden down the Coast Line several times and, although a fairly direct route from where I lived, it always seemed boring, no matter if I travelled during the day or night. This time I would leave from Roseville, and go down the Valley to Bakersfield and LA. I missed my usual night train out of Oakland to Roseville, so I spent the night in the yard, hoping to catch out in the morning. The next day found me ready to go at the crack of dawn, but there weren't any trains leaving. By noon my spirits, along with my wine supply were getting low, so I meekly made my way into town and got a Greyhound to Roseville, getting there in the late afternoon. Enjoying a newfound freedom from the crowded confines of the bus, I re-stocked my food and wine supply and walked over to the departure yard, which was almost vacant. Stopping at a shanty in the yard I learned that an LA train had "just left" and the guy didn't know when the next one would be in. He suggested that I stop by in an hour or so and ask the guy on the next shift, so I thanked him and walked back into town. To my delight the library was open and, after being directed to a storage closet to leave my pack, the librarian, sizing up my persona, told me that they had a large collection of books on railroads, and I quickly immersed myself in them. This was great! A clean, well-lighted place with comfortable chairs and friendly people — why hadn't I discovered this resource on countless other occassions of waiting hours for a train? Just about the time that I was ready to stand up and stretch my legs the librarian notified me that the library was closing, so I rounded up my pack, thanked her for her hospitality, and made my way by the last rays of daylight into the freightyard. This time there were two more rows of cars in the departure yard, and one had a caboose on it, so I began to walk the string looking for rides. Whatever enthusiasm I had for a quick getaway was doused by finding nothing but closed boxcars and loaded lumber cars. About the time that I'd made it maybe a third of the way up to the head end I heard the air being pumped into the brake lines, so I quickened my pace. Shortly I saw a figure ahead of me between the rows of cars, headed toward me. Ah, a brakeman I thought, and I could ask him if this train was going to LA or not. It wasn't a brakeman but another tramp, and he had been walking the same train looking for rides, except he started on the head end. We compared notes and realized that neither of us saw any good rides, and just as we turned to scurry back to the head end to catch the last unit the train began to pull out. We both stopped and rapidly tried to come up with a plan. I certainly didn't want to spend any more time in Roseville and apparently neither did he, but we didn't want to just grab a crappy ride for the long trip down to LA. At this point a flat car loaded with large pipes came by and without saying a word we looked up at the pipes, looked at each other, and both ran along and climbed on. This had to be better than spending another night in the freightyard, and we chatted briefly as we made our way up to the edge of the yard where large lights were everywhere, and it was time to get out of sight. 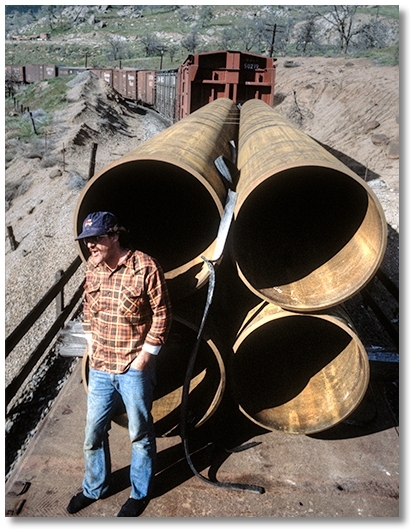 My new partner squatted down and backed into one of the bottom pipes, dragging his pack in behind him, and I did likewise in the other pipe, avoiding the upper pipes as I thought that they would become a wind tunnel when the train picked up speed, but such was not the case. I kept a sharp eye on the tracks ahead as we came into Sacramento, as we could either take the right leg of a wye and go back to Oakland, or the left leg and go to LA. I really didn't want to go back to Oakland, and I was relieved to find a plastic bag taped to the inside of "my" pipe that had some paperwork inside saying that the pipe was headed to El Paso, and I breathed a sigh of relief. Once we got underway we crawled up to the front end of our pipes and passed some wine back and forth, but it was too noisey to hold a conversation, and shortly we retired to our individual domiciles to sack out. I soon discovered that not only was it not windy inside, but the curvature of the sides kept my body from rolling from side to side, and after inflating my air mattress, stuffing in my foam earplugs and draining the bottle of wine, I settled into a surprisingly restful sleep. So restful, in fact, that I slept right through the crew changes in Fresno and Bakersfield, and woke up winding around in a circle at the Tehachapi Loop. Not that it mattered at this point, but it was a great opportunity to be able to watch the entire train at one time and see that there really weren't any other rides. Our car proved to be a smooth, steady ride and gave us the chance to sit up on top of the pipes during the day and take in the scenery, yet still giving us a place to hide when we passed through towns.